What In The World Is "Hardware Cloth"? Ask an old timer in your local hardware store for hardware cloth and he will know what to give you, the folks in most modern home centers have no idea what it is, but now you will know and can tell them. 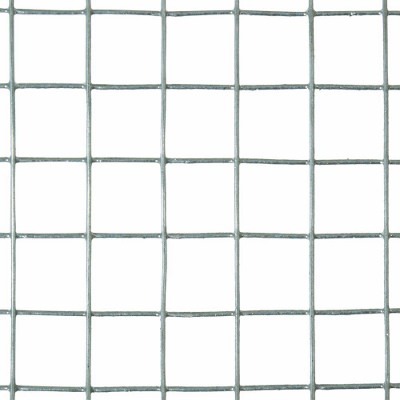 Hardware Cloth is wire mesh with ¼ inch to 1-inch square openings; made of steel wire and sometimes of stainless steel or galvanized steel wire. It has a number of different uses, including animal pens and garden enclosures, baskets, and organizers of various types and is often used to repair holes in walls; gardeners bury it in the ground to keep gophers out of their vegetable garden and it's sometimes used as a trellis to support plant vines. The origin of the term is rather unclear; however, it is commonly believed the term has evolved over the years from the basic elements used and the method in which it is made. The hardware term is from the steel and the fact that hardware cloth is sold in hardware stores, the cloth term derived from the method by which it is manufactured. It is available in different lengths and heights to suit almost any purpose; it’s durable but not always easy to use. It comes in rolls and tin snips or diagonal pliers are used to cut it. The next time you’re in your local Home Depot, ask the building materials associates to see the” Hardware Cloth”, and if they show it to you, you’ll know they really know their stuff! The last time I used hardware cloth was to make a compost bin. Using 2x2s for the simple framing with a couple hinges and a latch for the front to swing out like a door, all the spaces around the frame are hardware cloth attached with staples. It allows great airflow while still containing the organics and makes compost quickly. I keep some around the house all the time, as this stuff can be used for all kinds of projects. Perfect post Mike, sometimes you just need to get back to basics, fundamental items that somehow get overlooked…because you think, everyone knows…. just what they are. Once a new associate led a customer to me asking for “poultry netting”, he asked, “Do we sell something called, poultry netting? So funny was the reaction when I explained to him that it is also called, “chicken wire”. Hardware cloth, rabbit guard, and “poultry netting” are all items that are merchandised in the outdoor garden department at my Home Depot store; although the products are listed under building materials, all of them are fundamental garden supplies, burlap, and bird-block along with fencing posts and sod staples share the same selling space, all of which are basic garden supplies. Art students here in Boston often seek chicken wire for projects, the students use the chicken wire to make forms that will eventually be covered with plaster, cement, moss, or paper mache. I always advise using gloves when working with chicken wire and all of the wire fencing materials, the cut-jagged, metal, edges can scratch and cut you up badly, gloves are essential! Chicken wire also has a memory; it is sold in rolls and trying to lay it flat after unraveling it is not easy, two pairs of hands are better than one…so buy an extra pair of gloves. The “farmhouse décor” trend also features chicken wire as a design element instead of glass in cabinets and cupboards; chicken wire is spread across the door openings for a clean, open, rustic appeal. I love the look of chicken wire; I have used it in many projects that is how I know gloves are a critical part of a projects success. Check out this great project that uses chicken wire, also check out a similar project that uses a softer garden essential…burlap! Thank you Mike for inspiring me to think of products that are “taken for granted”, with the assumption that everyone knows…just what they are! I am going to take note now with all the new associate hitting the Home Depot sales floor seeking knowledge with their questions about basic products. This looks great and I will definitely use this in my garden!